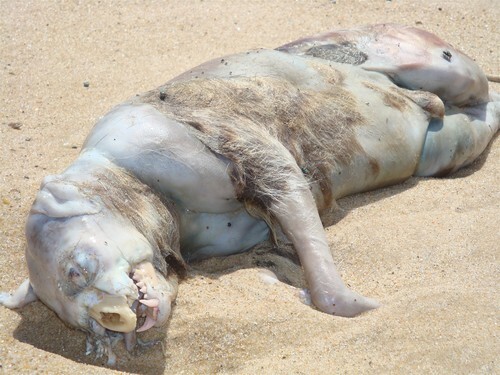 I know, here I go again with this Montauk Monster thing. Not otaku related but I live in eastern Long Island so its big news here. The picture above I only found through some semi-deep searching online of it. Most of the pictures shown are of the two I'll post below. The 1st picture that's on my previous post is the most popular but this one is barley seen and it links the two pictures mainly circulated around. This is because in this picture you can see the red part of it on the upper right that's not in the grayish second picture but in the original picture. 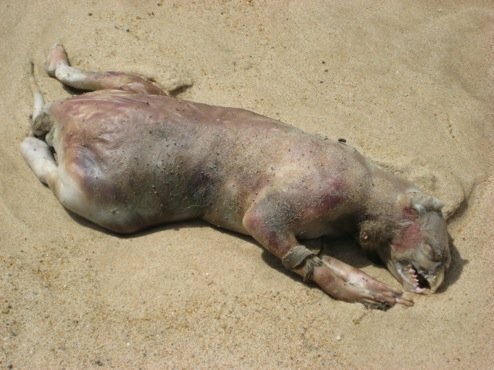 Picture number 2 and this one shows that this was probably a wild boar or we are all being conned by some hoax. It could also be Gannon from Legend of Zelda....see I still kept it anime or video game related. 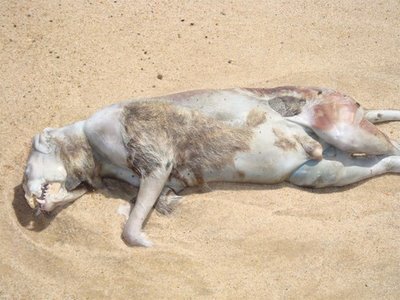 Actually, somebody identified the "monster" as being that of a body of a decomposing raccoon, and proved it quite well.